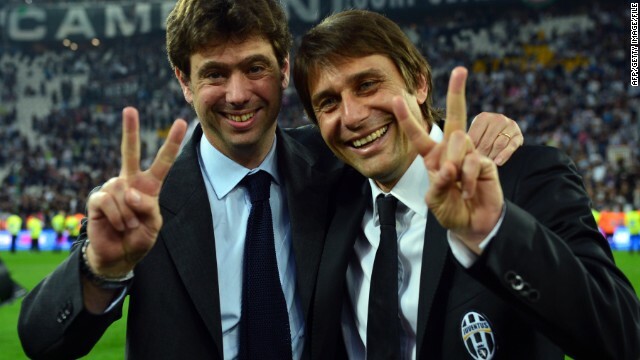 Juventus president Andrea Agnelli (left) celebrates the Old Lady's 2013 Serie A title win with the club's coach Antonio Conte. 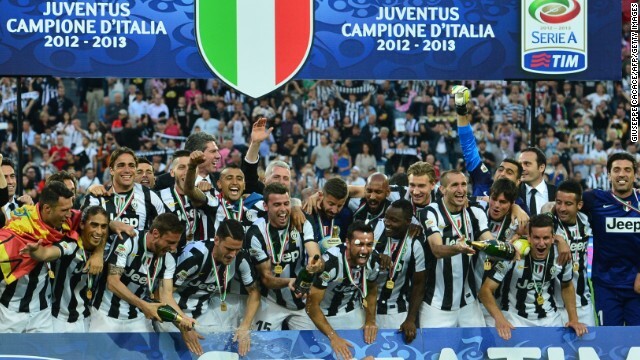 The "Bianconeri" won their first Serie A title for nine years in 2011, going through the season unbeaten. It capped their resurgence after the "Calciopoli" match-fixing scandal that saw them stripped of two Serie A titles and demoted to Serie B in 2006. Juventus acquired Argentina striker Carlos Tevez from Manchester City in June 2013 ahead of the club's bid for a third straight Serie A title. In third place after eight games, Conte's team is desperate to again qualify for the lucrative European Champions League. The club moved from the dilapidated Stadio delle Alpi to the new Juventus Stadium in 2011. It is smaller, but attendances are up -- as is revenue. Agnelli is hoping other clubs in Serie A with old stadiums will follow Juve's lead. 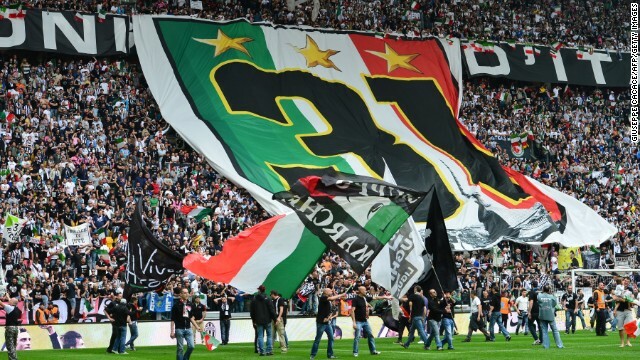 Juventus Stadium provides better facilities for fans and also a more intimate experience, with supporters being much closer to the action than they were at the cavernous Stadio delle Alpi. (CNN) -- If the "Old Lady" of Italian football needs a sharp reminder of where she wants to be, Wednesday's European Champions League clash should provide it. Any trip to the Bernabeu to face Real Madrid -- the nine-time champion of Europe -- is one to savor, even for a club of Juventus' stature. It will also reinforce president Andrea Agnelli's resolution that his rejuvenated side still has a long road to travel before its regeneration is complete. The Turin team's name in Latin means "age of youth" -- and this journey, for a club formed 115 years ago, is indeed still maturing. When Agnelli took charge in 2010, becoming the fourth member of his family to take the role, the Italian giant was still piecing itself together from the "Calciopoli" match-fixing scandal which saw it stripped of two Serie A titles and demoted to the second division in 2006. The 37-year-old has overseen a transformation of Juve's fortunes on and off the pitch, the club having moved to a new stadium at the start of a season in which it would claim its first title in nine years. Yet despite increasing revenue by 32.8% in the past financial year, the "Bianconeri" still made a loss of €15.9 million ($21.9 million). Real Madrid, on the other hand, posted revenue of €520.9 million ($715.8 million) -- 36.9% of which was profit. 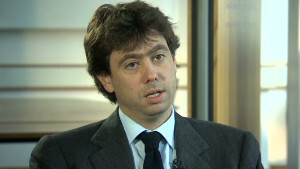 "Stadium and sponsorship, those are the two elements that we have to grow, to reach a point to become independent from Champions League revenues," Agnelli told CNN in an exclusive interview. "Then, once you get them, that is the extra fat you can work on. "At the moment, and this is the thing that worries me the most, we are still dependent on that (Champions League income) to make the numbers meet." Juventus made more money than any other club in last season's competition -- €65.3 million ($89.7 million) -- over €10 million more than eventual winner Bayern Munich. That figure owed largely to a domestic television deal that improved once fellow Italian club Udinese failed to negotiate its way through the playoff stages. The windfall underlines how vital a revenue stream it is for the club, and the precarious nature of an existence which relies on the luxurious flow of money from competing at Europe's top table. That fact is even more evident after last weekend's results. Despite leading 2-0 at Fiorentina on Sunday, Juve eventually fell to a 4-2 defeat, a result that leaves it five points behind leader AS Roma and vulnerable to attack from the likes of old rivals AC Milan and Inter -- both circling below. If Juve doesn't manage to make it a hat-trick of a successive Serie A titles, it must at least cling onto third spot to qualify for the Champions League playoffs. Should the club then make the lucrative group stages, that revenue will tide it over until the end of next season, when several key financial shackles will be lifted. "This year and the following we are going to struggle, but in 2015-16, that is when a number of important contracts expire and others can kick in," Agnelli explained. "That should put us in a position to become independent from European sports competition revenue. That will be very important for the club. "It means the year you might fail on sports results, it doesn't compromise the work in (other) years. "The only alternative you have if that is the case is to sell an asset you have grown internally, and we don't want to do that because we want to be competitive." A vital component of Juve's future is its new stadium. Its former Stadio delle Alpi home, built for the 1990 World Cup in Italy, was cavernous and crumbling. Stifling in terms of facilities and atmosphere, it had become a 69,000-capacity relic. 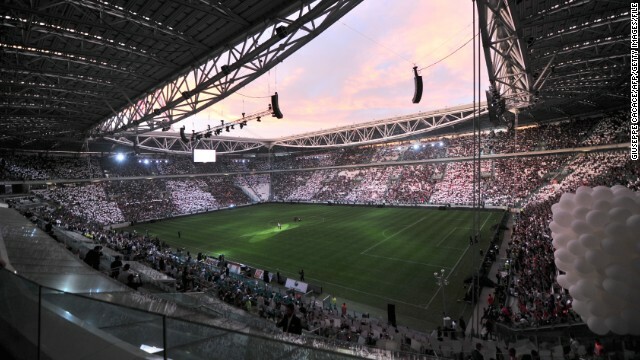 The Juventus Stadium may be significantly smaller, with an all-seater capacity of 41,000, but it is regularly full and provides a far more intimate experience for spectators. Whereas the stands at the Stadio delle Alpi were an average of 70 meters away from the pitch, fans at its replacement are just seven meters from the action. And though the move has increased revenue, Agnelli claims Juve is being held back by a clutch of old stadiums that proliferate Serie A. "Our stadium has been very important but I think we've filled the gap with the European competition," Agnelli added. "At the moment it's very important from an environmental point of view because it really does give a different rush to the team. But we struggle in terms of pricing because all our competitors are in old stadiums. "The perfect benchmark for our stadium is Stamford Bridge -- 41,000 people both of them -- but Chelsea generate more than double we do in terms of pricing." According to Agnelli, Juventus Stadium is not only vital to renewing his club's future, but can also act as a lightning rod for Italian football. Whereas once it was the most desired place to play domestic football in Europe, now it has fallen behind England, Germany and Spain, with Portugal and France gaining ground all the time. "There are a lot of resources which can be gained from the stadium but we also suffer from the same show, which is being put up at our competitors' stadiums. They are obsolete and they price them completely differently," Agnelli explained. "You can debate that Juventus vs. AC Milan is the same as AC Milan vs. Juventus in terms of the show on the pitch but the theater is completely different -- they price it one way, we price it another. 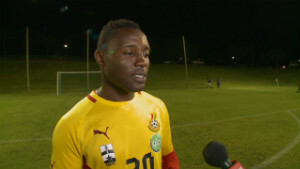 "That kind of becomes unacceptable for the spectator. Once all the others get new stadiums -- if and when -- that means you can raise the whole level of the show. "That for us is paramount because us alone, we are just a white flag, as interesting as we might be."